Last night https://www.periscope.tv/PlaygroundPoker/1RDGlbWBwONxL we had the very first Poker Punchout at Playground Poker Club, Montreal. All five players appeared on time and all five played - alas, however, there was no $10,000 winner this week! MC’d by radio personality Conor McKenna there are plenty more chances to win in coming weeks - with shots at $10,000 and $100,000! Guillaume Germain: $70, $80, $85 for a total of $245. Eric Finesilver: $85, $95, $85 for a total of $265. Troy Mace: $70, $85, $80 for a total of $235. Eric Boissonneault: $80, $70, $70 for a total of $220. Serge Denis: $95, $105, $85 for a total of $285. How does it work? Just deposit to Tonybet at Playground Poker and you win an entry into this special competition! The Punchout game-board contains 20 slots, each identified by a unique playing card. Players must ‘punch’ through exactly 3 slots, and retrieve the envelopes from within. Each envelope contains a listed dollar amount. If the sum of all 3 envelopes is less than $300, the player will win that amount as unrestricted funds on his/her Tonybet account. If the total of all 3 envelopes is equal to $300, the player wins the grand prize, in cash. All winners will be contacted within 24 hours. Participants will need to present themselves at Playground Poker Club on the following Monday (March 21, 28 and April 4, respectively) at 7:00pm; at which point they will each play Poker Punchout, for $10,000! 5 raffle winners will be selected at 9:30pm on Friday April 1, 2016. Participants will need to present themselves at Playground Poker Club on Monday April 4 at 7:00pm; at which point they will each play Poker Punchout, for $100,000! 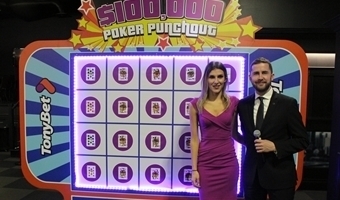 Every entry from the prior four $10,000 Poker Punchout raffles will be included in this draw. The grand prize is $10,000 for the next 3 games (March 21, 18 and April 4), and $100,000 for the finale (April 4). For full terms and conditions and rules see display at venue.